Confident and spirited rodeo photographer Celia McGraw is determined to capture the best images possible. Fearless, she’s the last person to back down from a challenge, even when it puts her in danger. However, her biggest risk isn’t found in the rodeo arena, but in the way her heart responds to one incredibly handsome stock contractor. 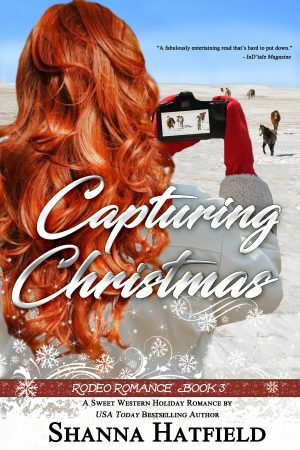 Will Kash and Celia capture the spirit of Christmas and each other’s hearts? Too stunned to reply, Celia gulped and continued staring at him, gradually comprehending she hadn’t been killed. At least she assumed she hadn’t died, unless angels wore dusty cowboy hats, dark blue chaps, and were breath-stealing handsome. Those engaging eyes bore into hers, making her heart skitter in her chest while an entire bushel of butterflies burst into flight in her stomach. She observed her rescuer. He sat tall in the saddle and had muscles to spare, or so she assumed from the way he easily hoisted her off the ground and onto his horse. A hint of thick brown hair peeked out from beneath the brim of his hat. The light blue shirt he wore almost matched the fascinating shade of his eyes. Celia experienced the most unreasonable urge to run her fingers along the stubbly expanse of his cheeks, down his square jaw, and over his strong chin. Mesmerized by his full bottom lip, she inhaled a deep breath and nearly choked. The very scent of him hinted at a lethal combination of freshly fallen snow, a warm winter fire, and sweet seduction rolled into one incredibly enticing package.